College is an important transitional time for students. On one hand, college presents a wonderful opportunity to cultivate food preferences and lifestyle practices to promote a lifetime of health and wellbeing. On the other hand, navigating in a sea of overwhelming food choices and constant social pressures is very challenging. The siren song of “perfection” calls out to us from magazines, TV shows, billboard ads and websites. It is very easy to start comparing yourself to these images. Societal pressures coupled with the social pressures of college can create a “perfect storm” of increased vulnerability in developing poor body image. Love is the foundation of healthy weight maintenance, weight loss or achieving new fitness goals. If you hate yourself or your body you will not want to treat it with the respect and love it deserves. This hatred can manifest itself in obsessive exercise, binge eating, disordered eating practices, low self esteem, depression, or restriction, or any combination of the above. I have decided to block all fat, negative talk from my life. I challenge you to join me and bring some more self love and body appreciation into your life! Write It– Write yourself a love letter. Graffiti it on your mirror. Make a list of things you love about yourself, then refer to it regularly, especially when you’re feeling particularly vulnerable. Live It! Don’t put yourself or others down. Don’t let the negative comments rule your life, and always strive to accentuate the positive. Support Yourself! Find a friend and make a compliment challenge. Commit to creating a positive body image for the both of you. Step Away From The Scale: If your weight needs to be monitored, leave that up to the doctors. Don’t let the number on the scale define you. How much you weigh should never affect your self-esteem or your sense of who you are. Take Some Time For You: Put yourself first. One a month get a massage, a manicure, or a facial. Pamper yourself to long hot baths by candlelight. Get together with a friend and give each other pedicures. Buy lotions that feel and smell good and treat yourself to some perfume or body mist. Take naps when you need to, just because you can! Spread the love! Tell your best friend that she is beautiful, just the way she is. Compliment a stranger. Check out Operation Beautiful for inspiration. Don’t tolerate criticism of your body or your friends. Stop Fat Talk in its tracks, maybe even start a Fat Talk Free Week! Guiltless- Improving your relationship with you and food. Medicinal Marzipan Learning to Love Your Body One Day at a Time. The Body Image Project -When you look in the mirror, what do you see? 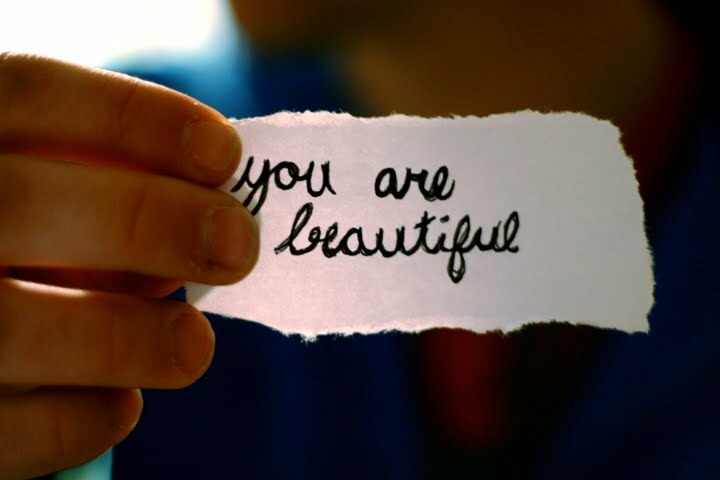 The Beauty Message Challenge -Have you told yourself you’re beautiful today? If you are at BU, join us tonight for a panel on Body Image . Stacey Zawacki, the Director of the Nutrition & Fitness Center will be speaking along with other nutrition and health experts! Also, be sure to check out the Love the Body You’re In article from BU Today. I don’t necessarily agree with the ‘love your body’ regardless of what it is philosophy. While I’m no doubt completely against any negative comments or attitudes being made about peoples physical conditions, the fact is obesity is unhealthy. By being significantly overweight you’re doing damage to your body when you could be exercising and eating correctly to make a change and get healthy. The same is true of those who go overboard and don’t eat enough. Self esteem is often the underlying contributing factor in these situations. I know my body isn’t perfect and I don’t ‘love it’ but I realize that it’s a very small part of who I am and as a result I don’t care if there are flaws. What I do care about is if I’m unhealthy and have less life to live with my loved ones. This is perhaps the most important blog post I’ve read in the last month. Too many people around us are so absorbed in bad image of themselves that they sometimes don’t even make contact with anyone around them. I’ll send this post to some people I know who need help. I’m sure that by implementing even some of the tips here they’ll do great.